When Bobby Jones envisioned that Berckmans' Place (near Augusta, Georgia) could be transformed from a horticultural paradise into a golf paradise, he was right. The land was perfectly suited to become a golf course. In 1857, a Belgian baron named Louis Mathieu Edouard Berckmans, who was an amateur horticulturist, purchased nearly four hundred acres on the western border of Augusta, Georgia, that had once been an indigo plantation [owned by Dennis Redmond], indigo having been one of the South's chief exports, along with cotton and rice, until the Civil War. The plantation was said to have been the site where General James Edward Oglethorpe had sat about a cheery fire of pine knots and smoked the pipe of peace with the Cherokee Indians, thereby opening the way for Georgia to become a colony and, eventually, a state. Berckmans's son, Prosper Julius Alphonse, was also a horticulturist, and a professional one at that, as well as an agronomist. Forming a partnership under the trade name of Fruitlands Nurseries, the two Berckmanses started what may have been the first commercial nursery in the South. It was certainly the largest. A catalog they issued a few years after opening the nursery listed thirteen hundred varieties of pear and nine hundred varieties of apple. Additionally, they imported a number of trees and plants from all over the world, the progeny of which, nurtured at Fruitlands, ended up decorating the exterior of some of the South's grandest homes and plantations for the next half century. The azalea, even still, remains the "floral signature" on the former Berckmans' property. 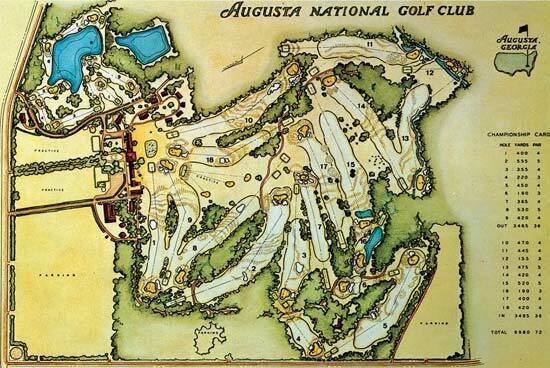 Today that land is known as the Augusta National Golf Club, host of the annual Masters Golf Tournament. Click on the top image for a beautiful view. Image of flowering plants, including azaleas, at Augusta National Golf Club. Online, courtesy Ticket City. 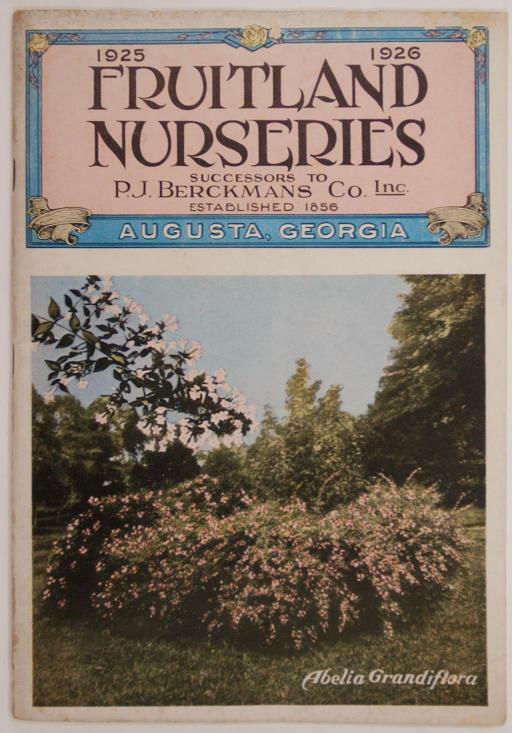 The 1925-26 catalog for Fruitland Nurseries, together with the golf-course layout, are online courtesy Augusta National Golf Club. Bos, Carole "Bobby Jones and Augusta National Golf Club" AwesomeStories.com. Jul 13, 2013. Apr 23, 2019.